Working rurally provides you with a broad and fulfilling training experience. 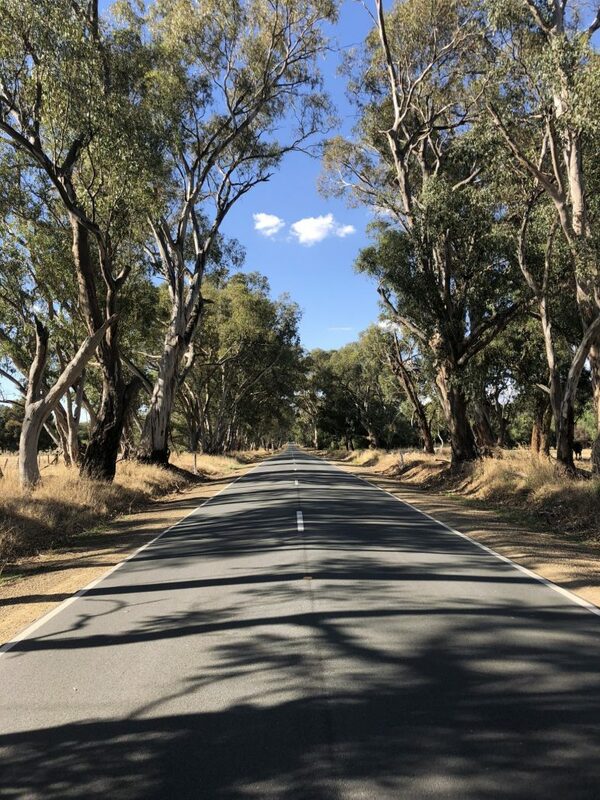 MCCC offers places in rural communities within the large regional cities – Warrnambool, Mildura, Ballarat, Greater Bendigo, Greater Shepparton, Albury Wodonga and a host of rural and regional communities, including coastal towns. Living and working rurally gives you the opportunity to further develop skills in a range of special interest areas such as obstetrics, anesthetics and emergency care. We believe the ideal training post is a rural area where you can work in a general practice treating a broad range of ages and medical needs. You may admit into the local hospital, providing inpatient care or work after hours care in their emergency department – experiencing true life and death situations. Being a key member of the local health service results in diverse presentations, continuity of care and career variety. See Dr Shiju Mammen’s testimonial on the fantastic lifestyle in one of our regional towns. There are many incentives to encourage registrars to establish a career in a rural or remote area. The Department of Health has established the General Practice Rural Incentives Program (GPRIP), through which some rural GPs will be able to access additional yearly remuneration for working in areas which experience greater difficulty in accessing medical care. The Modified Monash (MM) Model system categorises regional and remote locations using classifications MM2 to MM7. Payments increase according to the remoteness of the location and the period of time spent at the eligible area as outlined in the table below. For additional information about the GPRIP, including eligibility, service requirements and payment details, please see the Department of Health GPRIP guidelines. To view the MCCC MMM map please click here. Registrars who are International Medical Graduates (IMGs) may find they are subject to a ten year moratorium under section 19AB of the Health Insurance Act 1973 (HIA). The moratorium means that there may be restrictions on the eligibility of doctors to perform medical services under the Medicare Benefits Schedule (MBS). In order to qualify for MBS access, the HIA requires IMGs to practise in a region classified as a District of Workforce Shortage (DWS); supporting communities who have less access to general practitioners than the national average as determined by the Department of Health and Ageing. Being a rural GP can assist with these MBS restrictions, referred to as a scaling class exemption. Whilst an exemption does not reduce the length of the ten year moratorium for an IMG, it does provide the opportunity to significantly reduce the time doctors must practise in a DWS whilst subject to the moratorium. 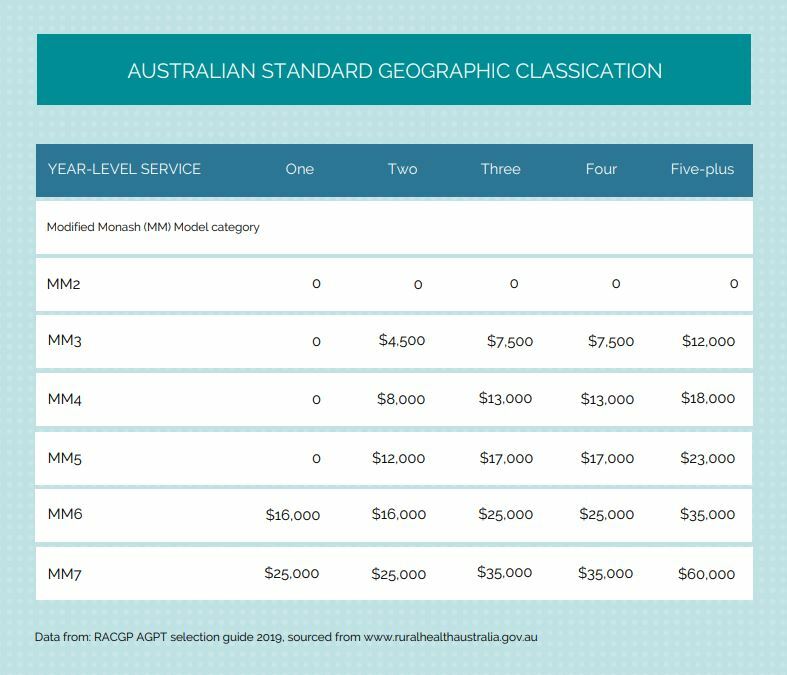 The potential benefits of working rurally are detailed in the Australian Standard Geographic Classification – Remoteness Area System (ASGC-RA) table (right). 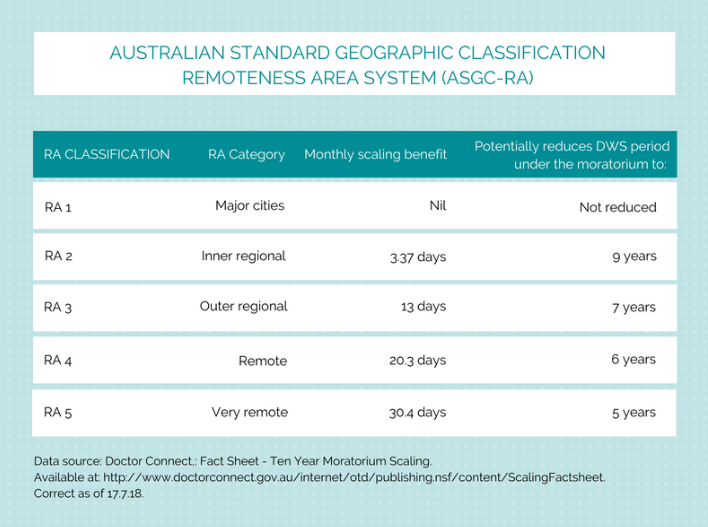 The ASGC-RA depicts the five-point scale used to classify the level of remoteness of every Australian street address, with more remote areas defined as a RA5 and attracting a higher potential monthly DWS reduction. Further information about the ten year moratorium scaling and section 19AB of the Health Insurance Act 1973 can be found on the Doctor Connect website.